After several rounds of voting with over 12,000 individuals participating, readers of Ballpark Digest and Spring Training Online chose Salt River Fields at Talking Stick as the leading Cactus League spring-training facility in the websites’ annual Best of the Ballparks polling, with 70 percent choosing the spring home of the Arizona Diamondbacks and Colorado Rockies. Salt River Fields opened for spring training 2011 in partnership with the Salt River Pima-Maricopa Indian Community (SRPMIC) as the first spring-training complex to be built on Indian land in the nation. The complex includes the 11,000-capacity ballpark, 12 practice fields and separate clubhouses and training facilities for both teams. It was a groundbreaker in another important way: it was the first LEED Gold-certified ballpark in the United States. This is not the first time Salt River Fields has recognized by Ballpark Digest: Salt River Fields was chosen as the Best New Ballpark in the annual Ballpark Digest Awards in 2011, with HKS Sports & Entertainment Group cited for the facility’s unique design. This is the second year for the Best of the Ballparks fan voting, where Ballpark Digest asks its readers to weigh in on their favorite MLB, Triple-A, Double-A, High-A, Low-A, Short Season A, independent, summer-collegiate, spring training and collegiate ballparks. Over 91,000 individuals voted in the 2015 competition, generating over a million votes. The leading Website covering the culture and business of baseball since its inception in 2002, Ballpark Digest (www.ballparkdigest.com) has been called an “indispensable” guide to baseball and ballparks by The New York Times; it’s been used as a source by publications and websites ranging from The Wall Street Journal to Epicurious.com. 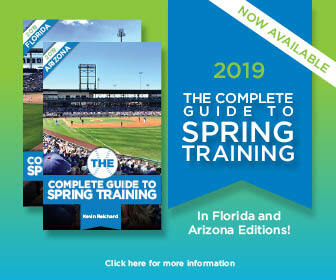 Spring Training Online (http://www.springtrainingonline.com/) is the leading guide to spring training on the Internet. August Publications is a publisher based in Middleton, Wis. Besides Ballpark Digest, August Publications websites include SoccerStadiumDigest.com, FootballStadiumDigest.com and ArenaDigest.com.